Much like baking a Christmas cake, designing for the web involves creating an experience in layers. Starting with a solid base that provides the core experience (the fruit cake), we can add further layers, each adding refinement (the marzipan) and delight (the icing). Don’t worry, this isn’t a misplaced cake recipe, but an evaluation of modular design and the role style guides can play in acknowledging these different concerns, be they presentational or programmatic. Although trained as a graphic designer, it was only when I encountered the immediacy of the web that I felt truly empowered as a designer. Given a desire to control every aspect of the resulting experience, I slowly adopted the role of an auteur, exploring every part of the web stack: front-end to back-end, and everything in between. A few years ago, I dreaded using the command line. Today, the terminal is a permanent feature in my Dock. In straddling the realms of graphic design and programming, it’s the point at which they meet that I find most fascinating, with each dicipline valuing the creation of effective systems, be they for communication or code efficiency. Front-end style guides live at this intersection, demonstrating both the modularity of code and the application of visual design. In our rush to build modular systems, design frameworks have grown in popularity. While enabling quick assembly, these come at the cost of originality and creative expression – perhaps one reason why we’re seeing the homogenisation of web design. Design systems still feel like a novelty in screen-based design. We nerd out over grid systems and modular scales and obsess over style guides and pattern libraries. We’re pretty good at using them to build repeatable components and site-wide standards, but that’s sort of where it ends. 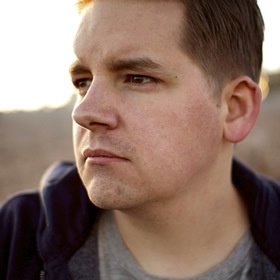 […] But to stop there is to ignore the true purpose and potential of a design system. Unless we consider how interface patterns fully embrace the design systems they should be built upon, style guides may exacerbate this paint-by-numbers approach, encouraging conformance and suppressing creativity. Let’s take a look at that most canonical of components, the button, and consider what we might wish to document and demonstrate in a style guide. The different layers of our button component. The most variable aspect of any component. Content guidelines will exert the most influence here, dictating things like tone of voice (whether we should we use stiff, formal language like ‘Submit form’, or adopt a more friendly tone, perhaps ‘Send us your message’) and appropriate language. For an internationalised interface, this may also impact word length and text direction or orientation. Note: One of the reasons I prefer to use <button> instead of <input type=“button”>, besides allowing the inclusion of content other than text, is that it has a markup structure similar to links, therefore keeping implementation differences to a minimum. We should also think about each component within the broader scope of our particular product. For this we can employ a further vocabulary, which can be expressed by adding values to the class attribute. For a newspaper, we might use names like lede, standfirst and headline, while a social media application might see us reach for words like stream, action or avatar. The appearance of a component can never be considered in isolation. Informed by its relationship to other elements, style guides may document different stylistic variations of a component, even if the underlying function remains unchanged: primary and secondary button styles, for example. A component can exhibit various states: blank, loading, partial, error and ideal, and a style guide should reflect that. Our button component is relatively simple, yet even here we need to consider hover, focused, active and disabled states. While it’s tempting to describe a component as series of layers, certain aspects will transcend several of these. The accessibility of a component, for example, may influence the choice of language, the legibility of text, colour contrast and which affordances are provided in different states. Even given this small, self-contained component, we can see several concerns at play, and in reviewing our button it seems we have most things covered. However, a few questions remain unanswered. Why does it have a blue background? Why are the borders 2px thick, with a radius of 4px? Why are we using that font, at that size and with that weight? These questions can be answered by our visual design language. More than a set of type choices and colour palettes, a design language can dicate common measures, ratios and the resulting grid(s) these influence. Ideally governed by a set of broader design principles, it can also inform an illustration style, the type of photography sourced or commissioned, and the behaviour of any animations. Whereas a style guide ensures conformity, having it underpinned by an effective design language will allow for flexibility; only by knowing the rules can you know how to break them! 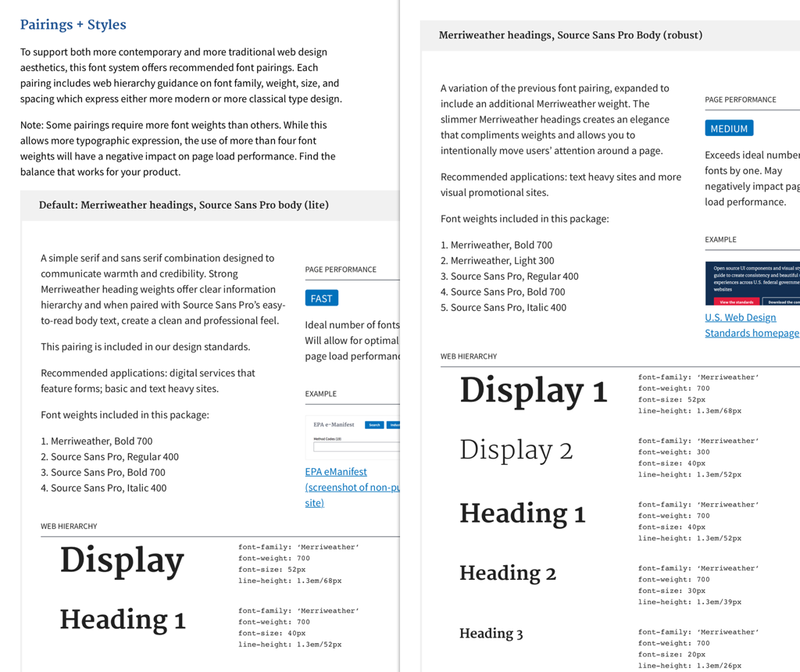 Type pairings in the US Web Design Standards guide. 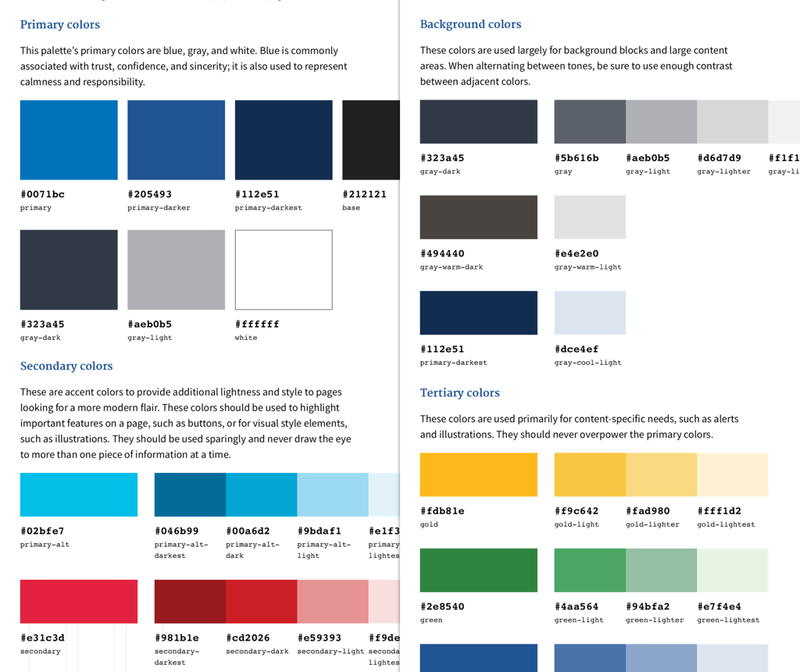 Colour palettes in the US Web Design Standards guide. Properly documenting our design language in a style guide is a good start, yet even better if it can be expressed in code. This is where CSS preprocessors become a powerful ally. In Sass, methods like mixins and maps can help us represent relationships between values. Variables (and CSS variables) extend the vocabulary provided natively by CSS, meaning we can describe patterns in terms of our own visual language. These tools effectively become an interface to our design system. Furthermore, they help maintain a separation of concerns, with visual presentation remaining where it should be: in our style sheets. The design for our simple component example. 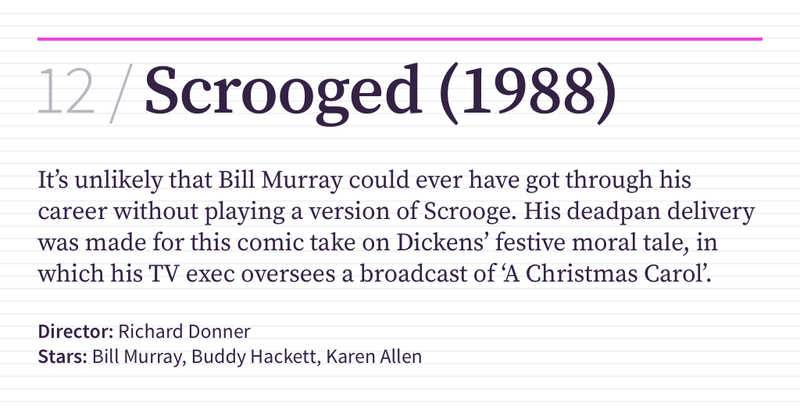 The design of a component on the Guardian website, described in terms of its Sass-powered design system. Alongside tools like preprocessors, newer CSS layout modules like flexbox and grid layout mean the friction we’ve long been accustomed to when creating layouts on the web is no longer present, and the full separation of presentation from markup is now possible. Now is the perfect time for graphic designers to advocate design systems that these developments empower, and ensure they’re fully represented in both documentation and code. That way, together, we can build systems that allow for greater visual expression. After all, there’s more than one way to bake a Christmas cake. 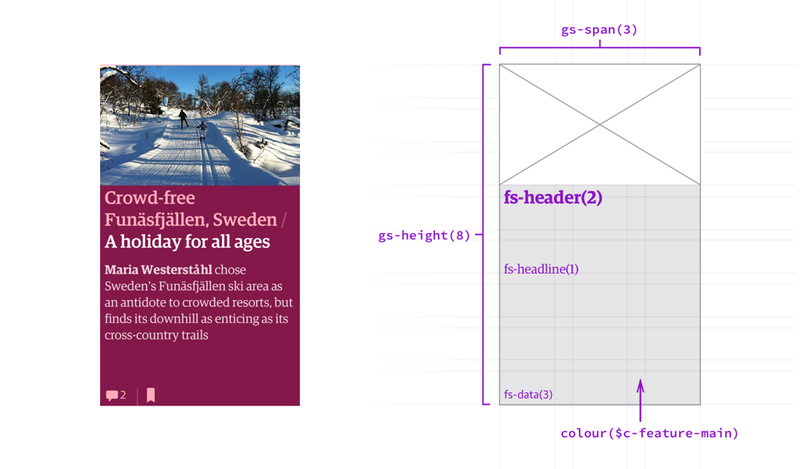 Stuart Robson tackles the thorny issue of integrating modern CSS Grid layouts into an existing design system, but in doing so reaps the benefits of leaner, more easily maintainable markup. It goes to show that with careful planning, there’s no reason old and new CSS layout methods cannot meet under the mistletoe.